The visual world around us displays a rich set of volumetric effects due to participating media. The appearance of these media is governed by several physical properties such as particle densities, shapes and sizes, which must be provided (directly or indirectly) to a rendering algorithm to generate realistic images. While there has been significant progress in developing rendering techniques (for instance, volumetric Monte Carlo methods and analytic approximations), there are few methods for measuring the scattering properties of a medium. In this project, we have developed a simple device and technique for robustly estimating the properties of a broad class of participating media that can be either (a) diluted in water such as juices, beverages, paints and cleaning supplies, or (b) dissolved in water such as powders and sugar/salt crystals, or (c) suspended in water such as impurities. The key idea is to dilute the concentrations of the media so that single scattering effects dominate and multiple scattering becomes negligible, leading to a simple and robust algorithm for estimating the scattering parameters. Furthermore, unlike previous approaches that require complicated or specialized measurement setups for different types or properties of media, our method and setup can be used to measure media with a wide range of absorption and scattering properties from a single high dynamic range photograph. Once the parameters of the diluted medium are estimated, a volumetric Monte Carlo technique may be used to create renderings of any medium concentration and with multiple scattering. 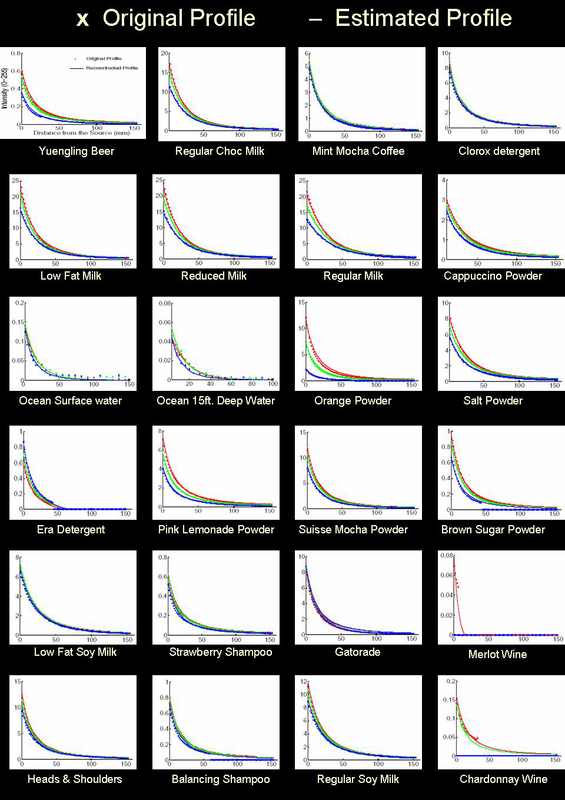 We have measured the scattering parameters of 40 commonly found materials that can be immediately used for rendering. "Acquiring Scattering Properties of Participating Media by Dilution,"
This picture shows the measurement apparatus used in our experiments. The 25 cubic cm tank is made of transparent anti-reflection coated glass and contains the scattering medium (for example, dilute milk). The material is illuminated by a small frosted bulb fixed to the side of the tank. A 12-bit Canon EOS-20D digital camera was used to capture approximately orthographic images of the tank. 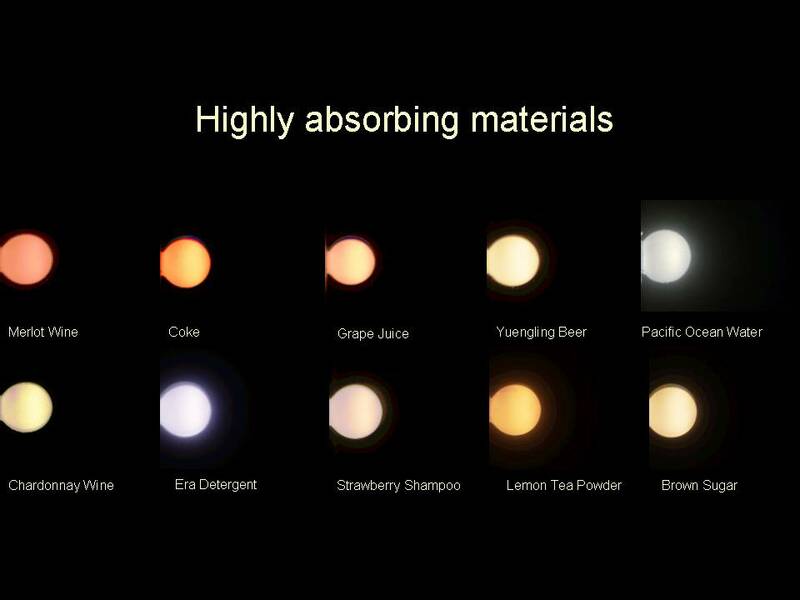 These acquired images of a diluted set of liquids are indicative of the scattering properties of the corresponding media. For example, highly scattering media show a glow around the bulb since light scattering results in blurring of bulb radiance. The extent of blurring increases with the amount of scattering exhibited by the medium. The negligible amount (or absence) of glow in these images indicate that the media are highly absorbing. The color of the bulb is an indicator of how the absorption varies across the three color channels -- red, green and blue. Here we compare plots of captured image brightness to profiles reconstructed using the estimated parameters. The accuracy of the fits (for the three color channels) for a variety of media, having a wide range of scattering and absorption properties, indicates the robustness of the estimation algorithm. A set of strongly absorbing liquids are lit by a single directional source in order to highlight the bright caustics. Caustic effects are created using Photon Mapping. Notice the bright color of the caustics and the liquid itself, characteristic of strongly absorbing media. The images have been tone-mapped to reproduce the full dynamic range visible to the human eye. 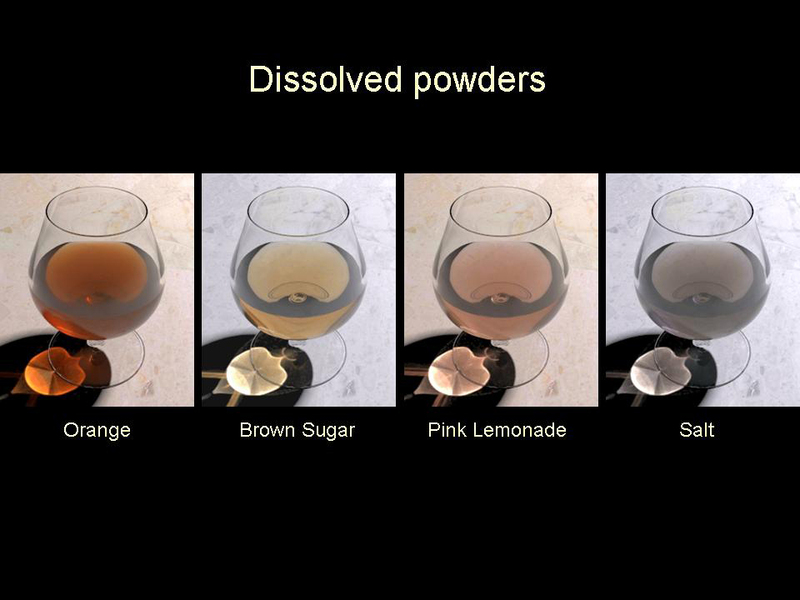 Similarly, powdered materials dissolved in water can be rendered using the recovered parameters. In daily life, participating media are usually viewed in complex lighting environments. These renderings use Debevec et al. 's kitchen environment map. 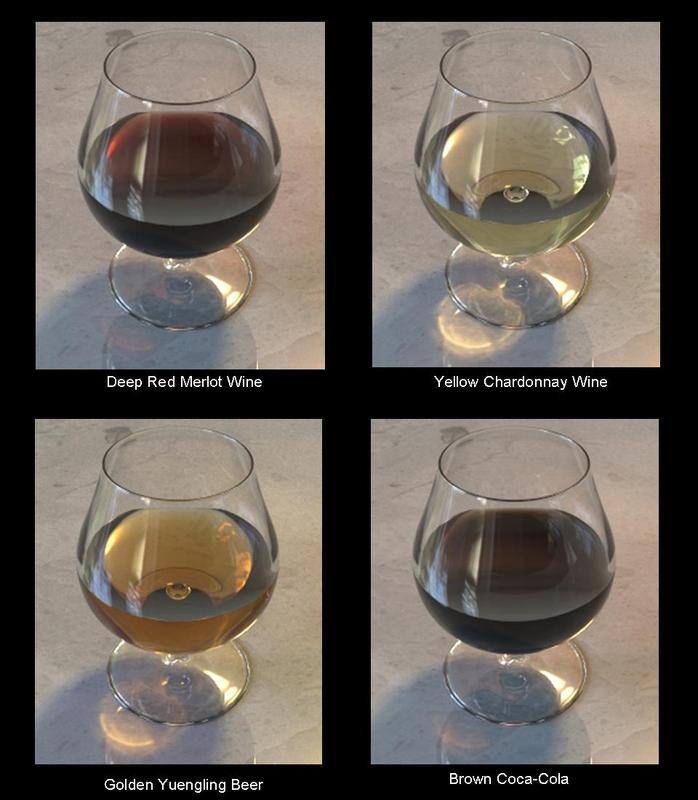 Notice the bright red color of the Merlot wine, and the soft yellow color of the Chardonnay. By mixing parameters of materials -- milk and espresso, in this case -- we can obtain the light brown color of light coffee. Note that a simple interpolation of images doesn't produce the desired result. This video is a compilation of the main results of this project. By scaling and blending scattering parameters, we can freely adjust material concentrations and interpolate between measured materials, simulating their mixture. 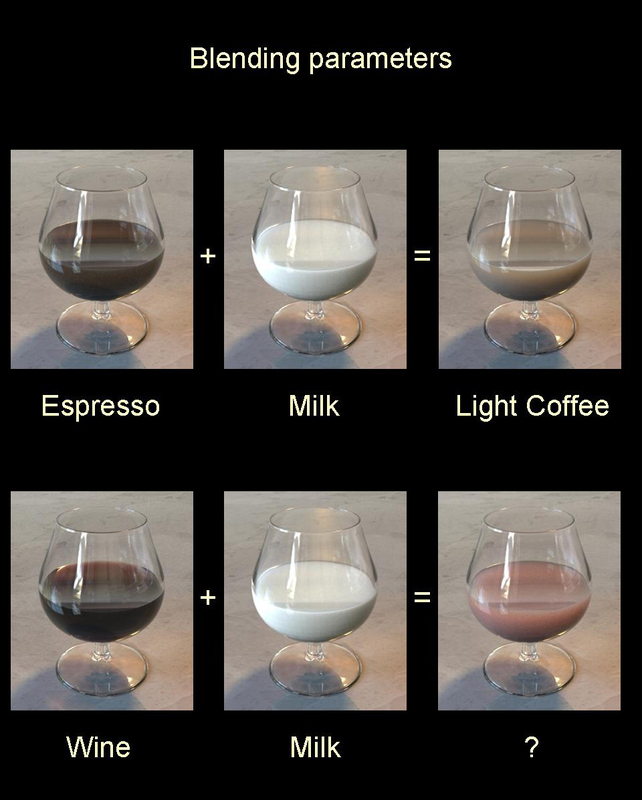 This video shows the gradual transition from wine to water to milk to espresso. For each medium, we capture images at several different degrees of dilution. 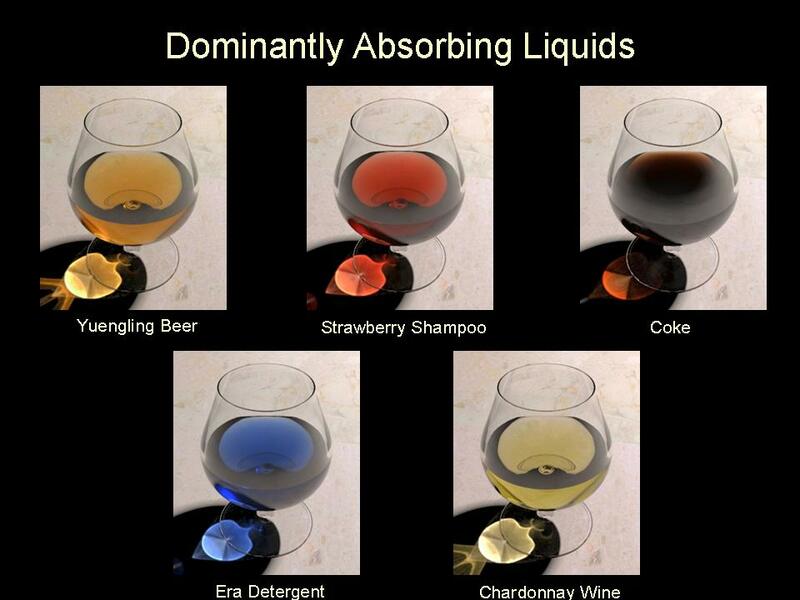 This video shows the scattering and absorption effects as the concentrations of wine and milk are increased in our experimental apparatus. 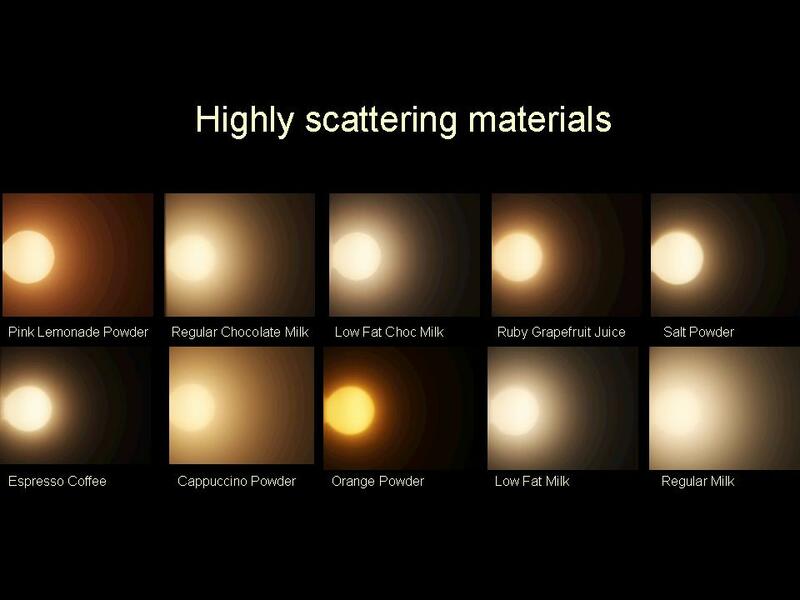 Milk is a highly scattering medium. Hence, we observe an increase in blurring with concentration. On the other hand, red wine is a highly absorbing liquid, exhibiting saturation, rather than blurring, of the bulb color with increasing concentration.